What is Allies & Safe Zones at Florida State University? Allies & Safe Zones is an ally development program to promote acceptance and support of Lesbian, Gay, Bisexual, Transgender, Queer, Questioning, Intersex, Asexual, Pansexual, and Two-Spirit-identifying (LGBTQ+) people. 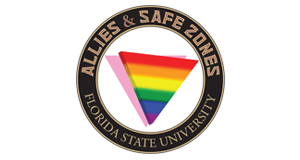 Allies & Safe Zones is coordinated through the offices of the Department of Student Governance & Advocacy at Florida State University and is offered regularly to the campus community. The program is open to all, regardless of orientation, identity, or expression. The Allies & Safe Zones re-launched in Fall 2013 as a new, more interactive program. If you attended a Safe Zone-Tallahassee workshop, we thank you for your continued support by inviting you to complete a Allies & Safe Zones 101 session to renew your commitment to being an ally. To promote acceptance and support of Lesbian, Gay, Bisexual, Transgender, Queer, Questioning, Intersex, Asexual, Pansexual, and Two-Spirit-identified (LGBTQ+) people. To provide a space to discuss gender, sexuality, and allyship and to explore how we can make our campus safer and more inclusive. To confront personal biases and increase understanding for participants at every level of knowledge and allyship. To discuss what it means to be an ally and demonstrate that allyship is a continuous process. To create trainings based in dialogue rather than lecture. To show that straight people have a sexual orientation, that cisgender people have a gender identity, and that heteronormativity does not just affect LGBTQ+ people. To push participants to examine the roots of their assumptions about gender and sexuality in hopes they will continue to do so in everyday life. To promote awareness of trans oppression and the impact of race, class, culture, ability, and other intersecting oppressions on LGBTQ+ identities.